You can put your own personal spin on your backyard for your garden path. You can even make your own stepping stones. Pathways in your garden don’t have to be dull. You can spruce them up with different kinds of materials to make them stand out among the flower beds. 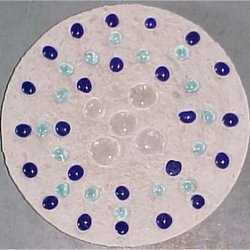 There is even an option where you’re able to make your own family project stepping stones. Concrete stepping stones are often the first thing that comes to mind when one thinks of the traditional path of garden pavers. So common that outlets like craft stores or DIY stores often sell stepping stone molds you can purchase. 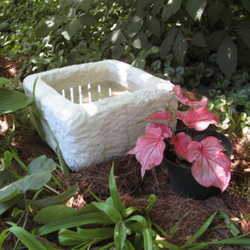 If that's not unique enough of a feature for your garden beautification, use the mold as a stepping off point to go even further and personalize your landscaping. 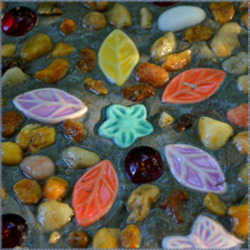 There are a variety of ways that you can decorate your stepping stones from mosaic tiles to handprints. Most places where you can buy cement also offer different color powders that can be added to the cement to make it a different color than just plain grey. Things that you’ll need to make your own stepping stones includes the mold or molds, quick-set concrete, bucket, handheld mixer, newspaper, gloves, drop cloths, cooking spray, clear spray paint, and decorations. You can make your own mold out of wood if you prefer, but there are plenty of pre-made molds if you choose. Keep in mind that you have to wait for the concrete to dry before the mold is free for the next stepping stone. You may want to purchase or make more than one mold. You want to find quick-set concrete as it’ll dry a lot faster and be ready to be placed in the garden sooner. It may be more economical to purchase a large bag from your local DIY center if you plan on making a large number of stepping stones for a pathway. Often, the price you pay for the craft store stepping stone mix will be more expensive for fewer pavers than buying the larger bag. You also don’t want to use your regular hand mixer to mix up the cement. You can buy attachments for your power tools that will mix up the concrete evenly or you can use a large mixer that you set aside for non-food uses. When it comes to decorations, the sky is the limit. You can use anything that strikes your fancy like sea glass, broken marbles, or pieces of pottery. Even use a seashell or leaves to leave impressions in the wet concrete. You’ll want to start by preparing your area. Put down your newspaper or drop cloth. It’s best to make this an outdoor activity because it can get messy, but if you do try it out indoors, make sure you use plenty of materials to catch any mess. Next, you’ll prepare your molds. Spray it with your non stick cooking spray. Read the instructions on the bag of concrete and mix it up following them. You may need to make a guess at how much concrete you’ll need for the number of stepping stones you’re planning on making. At this point, it can be helpful to put on the gloves and keep them on until you’re ready for the stepping stones to start drying. Pour in the concrete into the molds. Once it’s level, you can then add your embellishments. It should take about 24 to 48 hours for your stepping stone to completely dry. You can then remove it from the mold and put it in the garden. One final step that’s optional is spraying your stepping stone with clear spray paint. You can opt for glossy spray paint to add a nice gloss to your stone. This can be a great option if the items you have in your concrete could be damaged by the elements. Follow the instructions on the can and make sure you give it enough time to dry so it doesn’t smudge. There are a variety of traditional stepping stone materials to choose from. There are bricks, paving stones, flagstones, pavers, and tiles. Rocks of all shapes and sizes can be another traditional option. Small river stones or large beach rocks can look great as a pathway. There are also a large variety of non-traditional options that you can decide to use. Things like railroad ties, telephone poles, pallets, slices of wood, mulch, tumbled glass, and bamboo. A really neat option is the living paths that are made up of plants that feel nice on the bottom of your feet when walking. These are typically ground cover and other plants that are softer to the touch while being able to withstand people walking along them over and over. No matter if you decide to make your own family stepping stones or purchase other materials, stepping stones can be a fun choice for your garden. You can make your garden unique and personalized for you with the stepping stones you choose. There are many options available to you, and you can mix and match to get the perfect look. For instance, you and your family could each make a stepping stone as accent pieces for the rest of the walkway being filled in with bricks or river stones. It’s completely your choice.